It's a shame no-one told the Boyle family, who move into a gothic style house located right next to a cemetery, one with a bloody past and a gut-spraying future, what is yet to come. You'd think they'd twig something was when they discover that the basement door is nailed shut, but instead they stay long enough to discover their zombified non rent-paying lodger, the cellar-dwelling, flesh-hungry Dr Freudstein. "Fulci brings to the spook-show a relentless physicality. These 'ghosts' do more than just flap at you; they wrestle you, they pin you to the wall, they chew you. They're a wonderfully exciting combination of ghost and zombie, borrowing the best from each. And it's all about the imagery: Fulci hurls us into a seething carnival of blood, worms, entrails, popped eyeballs, squished brains and decaying flesh." Celebrated horror-auteur Eli Roth comments that Fulci, "in a span of 2 or 3 years changed the course of horror forever." 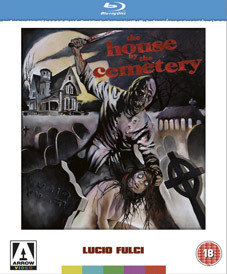 Previously released on DVD only by Arrow with an impressive transfer and a reasonable set of extra features (you can read our review here), The House by the Cemetery is to be given a new release as a Delexe Edition in both dual format (DVD and Blu-ray) and Limited Edition Blu-ray editions, also from Arrow, with a spanking new restoration and a cellar full of extra features. Both editions will feature a brand new High Definition restoration from the original negative presented totally uncut, optional English and Italian original uncompressed LPCM mono 2.0 audio and optional English subtitles for both the English (SDH) and Italian audio tracks. Original House by the Cemetery Trailer and TV Spot. Collector's booklet featuring writing on the film by author Calum Waddell. The dual format edition will sell for £19.99 and the Limited Edition Blu-ray for £24.99.